Many complex molecules called macromolecules, such as proteins, nucleic acids (RNA and DNA), carbohydrates, and lipids comprise cells. The macromolecules are a subset of organic molecules (any carbon-containing liquid, solid, or gas) that are especially important for life. The fundamental component for all of these macromolecules is carbon. The carbon atom has unique properties that allow it to form covalent bonds to as many as four different atoms, making this versatile element ideal to serve as the basic structural component, or “backbone,” of the macromolecules. Individual carbon atoms have an incomplete outermost electron shell. With an atomic number of 6 (six electrons and six protons), the first two electrons fill the inner shell, leaving four in the second shell. Therefore, carbon atoms can form up to four covalent bonds with other atoms to satisfy the octet rule. The methane molecule provides an example: it has the chemical formula CH4. Each of its four hydrogen atoms forms a single covalent bond with the carbon atom by sharing a pair of electrons. This results in a filled outermost shell. Hydrocarbons are organic molecules consisting entirely of carbon and hydrogen, such as methane (CH4) described above. We often use hydrocarbons in our daily lives as fuels—like the propane in a gas grill or the butane in a lighter. The many covalent bonds between the atoms in hydrocarbons store a great amount of energy, which releases when these molecules burn (oxidize). 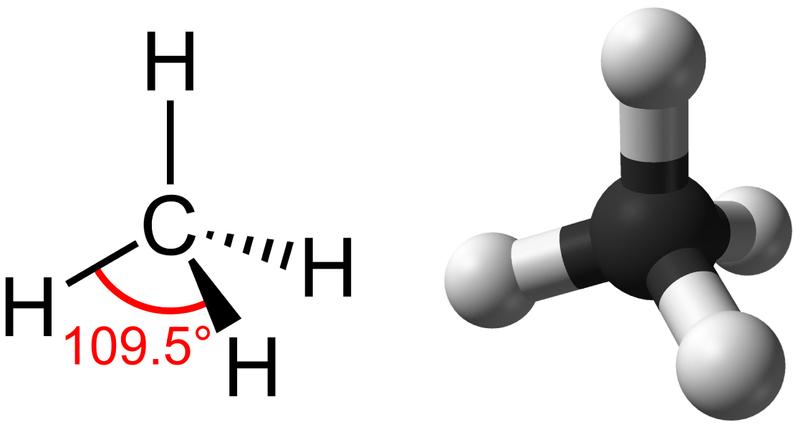 Methane, an excellent fuel, is the simplest hydrocarbon molecule, with a central carbon atom bonded to four different hydrogen atoms, as (Figure) illustrates. The shape of its electron orbitals determines the shape of the methane molecule’s geometry, where the atoms reside in three dimensions. The carbons and the four hydrogen atoms form a tetrahedron, with four triangular faces. For this reason, we describe methane as having tetrahedral geometry. Methane has a tetrahedral geometry, with each of the four hydrogen atoms spaced 109.5° apart. As the backbone of the large molecules of living things, hydrocarbons may exist as linear carbon chains, carbon rings, or combinations of both. Furthermore, individual carbon-to-carbon bonds may be single, double, or triple covalent bonds, and each type of bond affects the molecule’s geometry in a specific way. This three-dimensional shape or conformation of the large molecules of life (macromolecules) is critical to how they function. Successive bonds between carbon atoms form hydrocarbon chains. These may be branched or unbranched. Furthermore, a molecule’s different geometries of single, double, and triple covalent bonds alter the overall molecule’s geometry as (Figure) illustrates. The hydrocarbons ethane, ethene, and ethyne serve as examples of how different carbon-to-carbon bonds affect the molecule’s geometry. The names of all three molecules start with the prefix “eth-,” which is the prefix for two carbon hydrocarbons. The suffixes “-ane,” “-ene,” and “-yne” refer to the presence of single, double, or triple carbon-carbon bonds, respectively. Thus, propane, propene, and propyne follow the same pattern with three carbon molecules, butane, butene, and butyne for four carbon molecules, and so on. Double and triple bonds change the molecule’s geometry: single bonds allow rotation along the bond’s axis; whereas, double bonds lead to a planar configuration and triple bonds to a linear one. These geometries have a significant impact on the shape a particular molecule can assume. When carbon forms single bonds with other atoms, the shape is tetrahedral. When two carbon atoms form a double bond, the shape is planar, or flat. 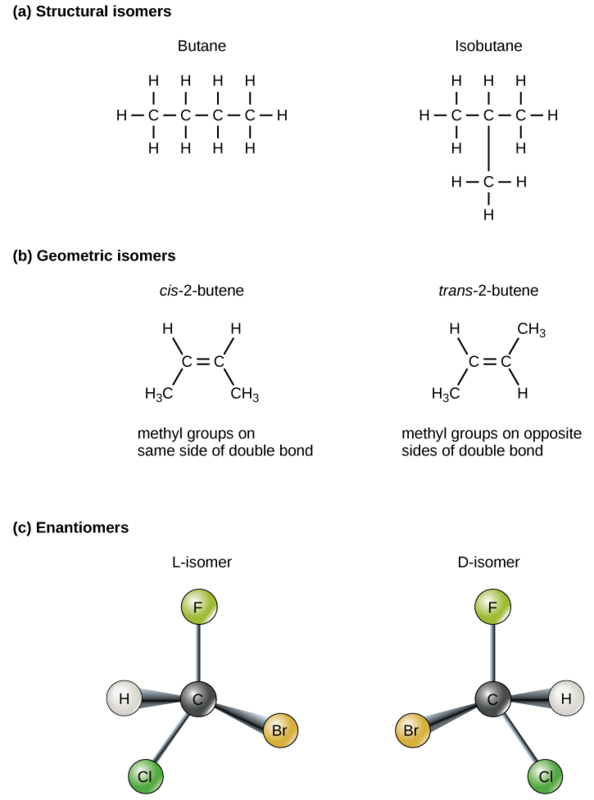 Single bonds, like those in ethane, are able to rotate. Double bonds, like those in ethene cannot rotate, so the atoms on either side are locked in place. So far, the hydrocarbons we have discussed have been aliphatic hydrocarbons, which consist of linear chains of carbon atoms. Another type of hydrocarbon, aromatic hydrocarbons, consists of closed rings of carbon atoms. We find ring structures in hydrocarbons, sometimes with the presence of double bonds, which we can see by comparing cyclohexane’s structure to benzene in (Figure). Examples of biological molecules that incorporate the benzene ring include some amino acids and cholesterol and its derivatives, including the hormones estrogen and testosterone. We also find the benzene ring in the herbicide 2,4-D. Benzene is a natural component of crude oil and has been classified as a carcinogen. Some hydrocarbons have both aliphatic and aromatic portions. Beta-carotene is an example of such a hydrocarbon. Carbon can form five- and six-membered rings. Single or double bonds may connect the carbons in the ring, and nitrogen may be substituted for carbon. The three-dimensional placement of atoms and chemical bonds within organic molecules is central to understanding their chemistry. We call molecules that share the same chemical formula but differ in the placement (structure) of their atoms and/or chemical bonds isomers. Structural isomers (like butane and isobutene in (Figure)a) differ in the placement of their covalent bonds: both molecules have four carbons and ten hydrogens (C4H10), but the different atom arrangement within the molecules leads to differences in their chemical properties. For example, butane is suited for use as a fuel for cigarette lighters and torches; whereas, isobutene is suited for use as a refrigerant and a propellant in spray cans. Geometric isomers, alternatively have similar placements of their covalent bonds but differ in how these bonds are made to the surrounding atoms, especially in carbon-to-carbon double bonds. In the simple molecule butene (C4H8), the two methyl groups (CH3) can be on either side of the double covalent bond central to the molecule, as (Figure)b illustrates. When the carbons are bound on the same side of the double bond, this is the cis configuration. If they are on opposite sides of the double bond, it is a trans configuration. In the trans configuration, the carbons form a more or less linear structure; whereas, the carbons in the cis configuration make a bend (change in direction) of the carbon backbone. We call molecules that have the same number and type of atoms arranged differently isomers. (a) Structural isomers have a different covalent arrangement of atoms. (b) Geometric isomers have a different arrangement of atoms around a double bond. (c) Enantiomers are mirror images of each other. Molecules with the formulas CH3CH2COOH and C3H6O2 could be structural isomers. Molecules must have a double bond to be cis–trans isomers. To be enantiomers, a molecule must have at least three different atoms or groups connected to a central carbon. To be enantiomers, a molecule must have at least four different atoms or groups connected to a central carbon. In triglycerides (fats and oils), long carbon chains known as fatty acids may contain double bonds, which can be in either the cis or trans configuration, as (Figure) illustrates. Fats with at least one double bond between carbon atoms are unsaturated fats. When some of these bonds are in the cis configuration, the resulting bend in the chain’s carbon backbone means that triglyceride molecules cannot pack tightly, so they remain liquid (oil) at room temperature. Alternatively, triglycerides with trans double bonds (popularly called trans fats), have relatively linear fatty acids that are able to pack tightly together at room temperature and form solid fats. In the human diet, trans fats are linked to an increased risk of cardiovascular disease, so many food manufacturers have reduced or eliminated their use in recent years. In contrast to unsaturated fats, we call triglycerides without double bonds between carbon atoms saturated fats, meaning that they contain all the hydrogen atoms available. Saturated fats are a solid at room temperature and usually of animal origin. 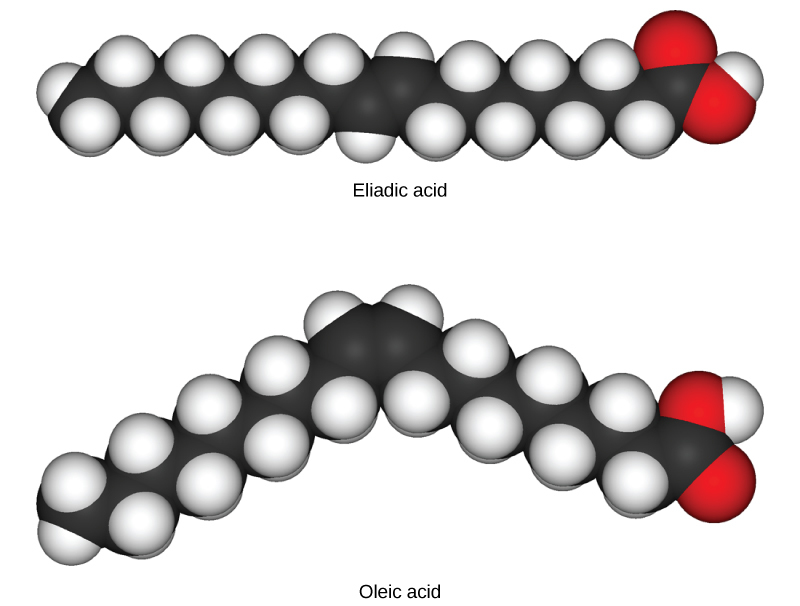 These space-filling models show a cis (oleic acid) and a trans (eliadic acid) fatty acid. Notice the bend in the molecule caused by the cis configuration. Enantiomers are molecules that share the same chemical structure and chemical bonds but differ in the three-dimensional placement of atoms so that they are non-superimposable mirror images. (Figure) shows an amino acid alanine example, where the two structures are nonsuperimposable. 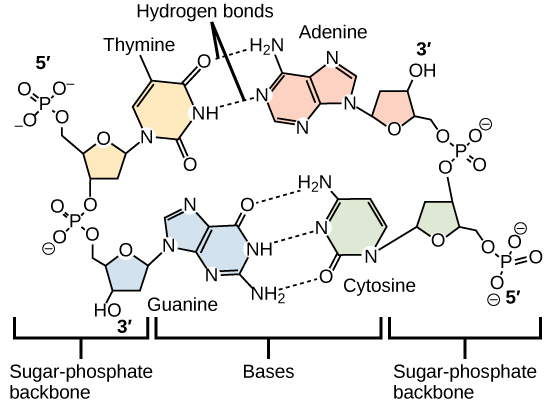 In nature, only the L-forms of amino acids make proteins. Some D forms of amino acids are seen in the cell walls of bacteria, but never in their proteins. Similarly, the D-form of glucose is the main product of photosynthesis and we rarely see the molecule’s L-form in nature. 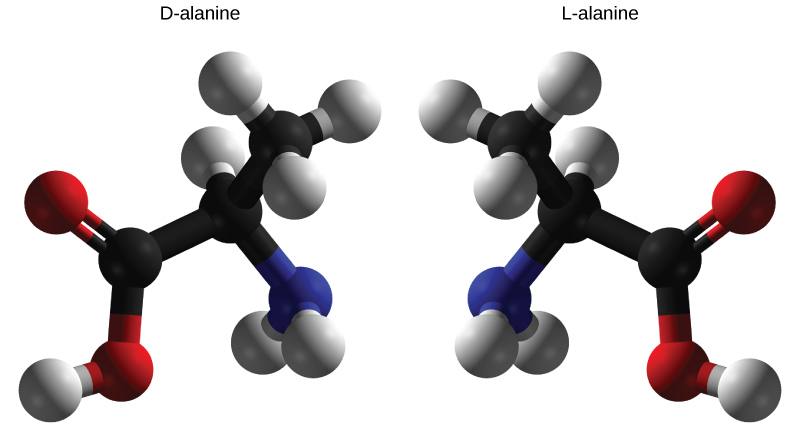 D-alanine and L-alanine are examples of enantiomers or mirror images. Only the L-forms of amino acids are used to make proteins. Functional groups are groups of atoms that occur within molecules and confer specific chemical properties to those molecules. We find them along the “carbon backbone” of macromolecules. Chains and/or rings of carbon atoms with the occasional substitution of an element such as nitrogen or oxygen form this carbon backbone. Molecules with other elements in their carbon backbone are substituted hydrocarbons. The functional groups in a macromolecule are usually attached to the carbon backbone at one or several different places along its chain and/or ring structure. Each of the four types of macromolecules—proteins, lipids, carbohydrates, and nucleic acids—has its own characteristic set of functional groups that contributes greatly to its differing chemical properties and its function in living organisms. A functional group can participate in specific chemical reactions. (Figure) shows some of the important functional groups in biological molecules. They include: hydroxyl, methyl, carbonyl, carboxyl, amino, phosphate, and sulfhydryl. These groups play an important role in forming molecules like DNA, proteins, carbohydrates, and lipids. 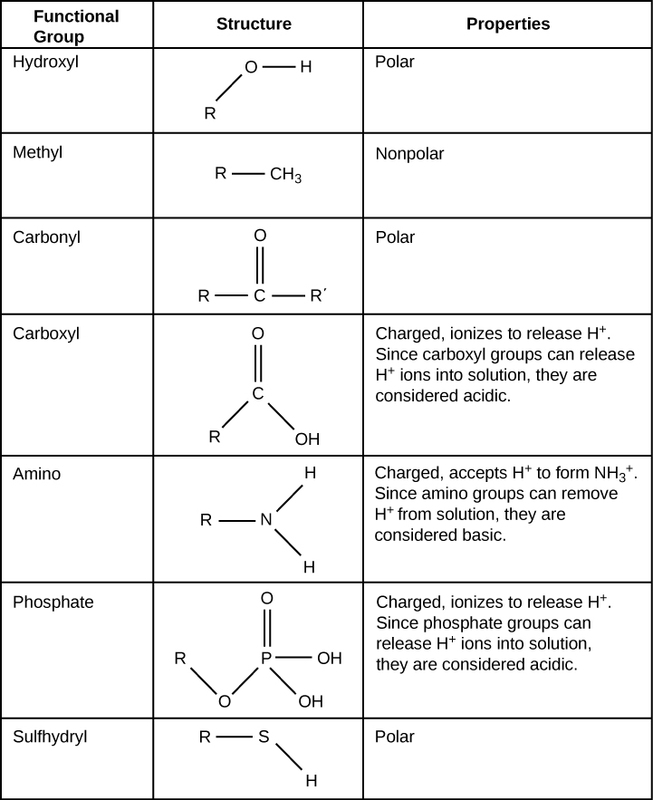 We usually classify functional groups as hydrophobic or hydrophilic depending on their charge or polarity characteristics. An example of a hydrophobic group is the nonpolar methyl molecule. Among the hydrophilic functional groups is the carboxyl group in amino acids, some amino acid side chains, and the fatty acids that form triglycerides and phospholipids. This carboxyl group ionizes to release hydrogen ions (H+) from the COOH group resulting in the negatively charged COO– group. This contributes to the hydrophilic nature of whatever molecule on which it is found. Other functional groups, such as the carbonyl group, have a partially negatively charged oxygen atom that may form hydrogen bonds with water molecules, again making the molecule more hydrophilic. These functional groups are in many different biological molecules. R, also known as R-group, is an abbreviation for any group in which a carbon or hydrogen atom is attached to the rest of the molecule. Hydrogen bonds between functional groups (within the same molecule or between different molecules) are important to the function of many macromolecules and help them to fold properly into and maintain the appropriate shape for functioning. Hydrogen bonds are also involved in various recognition processes, such as DNA complementary base pairing and the binding of an enzyme to its substrate, as (Figure) illustrates. Hydrogen bonds connect two strands of DNA together to create the double-helix structure. The unique properties of carbon make it a central part of biological molecules. Carbon binds to oxygen, hydrogen, and nitrogen covalently to form the many molecules important for cellular function. Carbon has four electrons in its outermost shell and can form four bonds. Carbon and hydrogen can form hydrocarbon chains or rings. Functional groups are groups of atoms that confer specific properties to hydrocarbon (or substituted hydrocarbon) chains or rings that define their overall chemical characteristics and function. (Figure) Which of the following statements is false? Each carbon molecule can bond with as many as________ other atom(s) or molecule(s). Which of the following is not a functional group that can bond with carbon? What property of carbon makes it essential for organic life? Carbon is unique and found in all living things because it can form up to four covalent bonds between atoms or molecules. These can be nonpolar or polar covalent bonds, and they allow for the formation of long chains of carbon molecules that combine to form proteins and DNA. Compare and contrast saturated and unsaturated triglycerides. Saturated triglycerides contain no double bonds between carbon atoms; they are usually solid at room temperature. Unsaturated triglycerides contain at least one double bond between carbon atoms and are usually liquid at room temperature. Carbon by OpenStax Biology 2nd Edition is licensed under a Creative Commons Attribution 4.0 International License, except where otherwise noted.